For the Indonesian translation click here. Aisha Johan: I am very drawn to one of your works, Pilgrimage to History, 2013. I feel that you are giving a voice to those who no longer have one, from mass grave to mass audience. Could you please tell me more about the work? 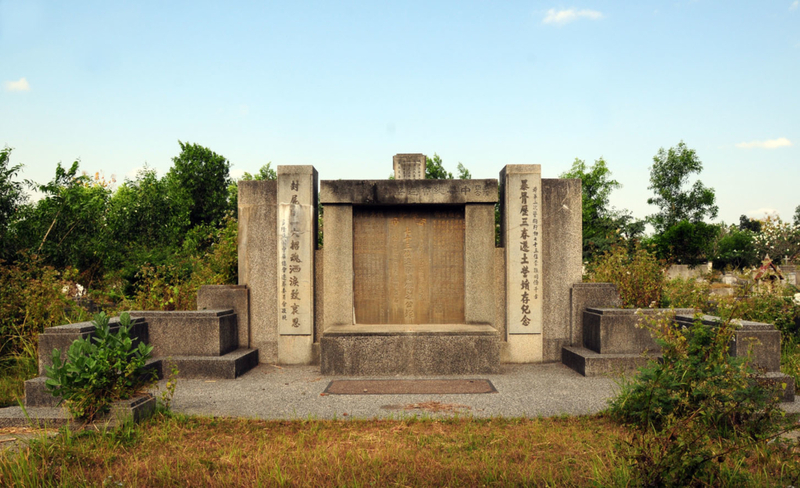 In 1951, Chung Hua Tsung Hui, an organisation for the Chinese community, called upon the local people to form a team to be on the duty of searching for the places where other Chinese were murdered and buried without a trace. This team dug out the bodies and gave them a proper burial in a cemetery. My father, as a photographer, was part of this team with the specific task of documenting this exhumation. In those photographs, my father included some information that provided the date and location of where these people were killed. I retraced the history of the genocide of the Chinese by conducting a survey to the villages where the victims were found. I subsequently obtained further information from friends about killings that had taken place in other towns. Stanley Adi Prasetyo gave me a document titled Memorandum: Outlining act of violence and humanity perpetrated by Indonesia band on innocent Chinese before and after the Dutch Police Action was enforced on July 21, 1947. The document encouraged me to find other mass graves in other towns. So far I have only made the search in several towns in East Java. I found a mass grave in Blitar, where 191 victims had been buried; in Tulungagung, with 73 victims; in Kediri, 310 victims; Nganjuk, 784; Yogyakarta, 26; Muntilan, 17. All had been buried in the Chinese cemeteries. The video performance of Berziarah ke Sejarah (Pilgrimage to History, 2013) shows my pilgrimage to a number of mass graves that I have found. This is a continuous project. To this day, I have found information that there are five mass grave in several towns in Central and West Java. I plan to visit them and conduct a performance as a form of pilgrimage to the victims. Aside from tracing the existence of mass graves, I also try to seek sources with direct experience of the events, perhaps as eyewitnesses. AJ: Being an Indonesian with Chinese descent and growing up during an era with vigorous anti-Chinese sentiments in Indonesia, your work has mostly focused on social political ideas and in recent years has shifted to your personal identity. You have also talked about, in one of your video works, how the cultural assimilation through education has influenced the life of Chinese-Indonesians where you grew up, particularly through the education system implemented by Dutch missionaries. How has the complexity of Indonesian history (not only your ancestors’, but also the history of Java and Indonesia under the occupation of the Dutch) informed your work? FXH: Since the year 2000, my work has used history and issues of identity amongst Chinese-Indonesians as a point of departure. When we talk about history, one cannot escape from a past where Chinese-Indonesians are inseparable from the development of history itself, as well as the development of the Indonesian culture today. Research plays a prominent role in shaping my ideas around creating and producing work. Re-viewing and bringing up again the problems that the Chinese have suffered in Indonesia does not mean that there has arisen in me a desire to rebuke, re-victimise or merely romanticise it all. Rather, there is a desire to take a shrewd look at them and learn from them, so that we do not forget and repeat past mistakes. A nation matures not because of the brilliant events and successes, but rather how the nation courageously recognises their past mistakes and learns from them. AJ: Do you believe that artists have social responsibility? How important is it for you to always have social messages in your work? Do you think the current Indonesian and wider Southeast Asian contemporary art scene reflects this responsibility? FXH: Artists should have social responsibilities, and their artwork should also be a reflection of that responsibility. I believe the scale of an artist’s social responsibility is crucial in establishing the quality of their work. Artworks that portray social responsibility signify that they have a contextual relationship with the people around them. Artworks with no context lack roots and as a result, those artworks have neither social nor cultural value. At this point in time, it seems that not all artworks produced by artists in Indonesia can demonstrate that they have a clear and strong understanding of that context. Artists are members of a cosmopolitan society, and the culture in which they live is such a complex culture. When there is a lack of awareness of their position within a social structure and a lack of knowledge about the development of that culture it will have a negative impact upon artists whereby they find it difficult to situate their work in this complex and rapidly developing society. As a result of this difficulty, some artists will find that social responsibility isn’t that crucial to their practice. AJ: During the 1960s, it has been said that the Indonesian press adhered to an authoritarian concept. It acted as a funnel for the government–a tool of revolution–in an attempt to indoctrinate the 1959 political manifesto. Those who refused were restrained or forced to cease operations altogether, and by this time, Chinese publications were banned. This impeded Indonesian press at that time, limiting the scope of criticism towards the Indonesian government. Looking at the current state of Indonesian media, it seems as though the press has more freedom now, in a post-Soeharto era, compared to the 1960s in terms of giving voice to the oppressed and reporting on the historical discrimination. Do you agree with this sentiment? And how has the artist’s role as an activist / artist with social responsibility shifted now because of this? FXH: Freedom to express one’s opinion in Indonesia is more unrestrained now compared to under Soeharto’s New Order regime. With this freedom, and also shifts in cultural development, what we can witness are changes in the understanding of social activism. Moreover, with an operative democracy, the idea of activism as it existed during the New Order–as an act of resistance against the government’s policy–has also shifted. Activism can be seen as a shift in consciousness in order to form an understanding of various problems that the people are facing together as a society. The issues that they confront no longer deal solely with governmental dominance, but also the supremacy enabled by capitalism, the authority that is sprouted from fundamentalist groups, or even a form of control that is essentially primordial. Therefore, the social problems that people now face are increasingly diverse and these issues are not just tangible ones, these issues could be a state in which urban society gives rise to the alienation of an individual. These problems will also affect changes in meaning and activism. AJ: The New Art Movement, which you co-founded with several other artists in 1975, was formed because you felt that Indonesian art at that time was focused too much on a universal audience, so that they can be a part of the international art forum. You felt that if Indonesians wanted to talk about Indonesia through art, they had to talk about the people, their sufferings, and to utilise what is available to them to produce artworks. Have you seen this trend in creating and producing artwork change recently, specifically with art coming out of Indonesia? Do you think Indonesian art has integrated western concepts into traditional practices of art making or have younger artists have rejected western philosophies and embraced tradition in order to carve out a contemporary Indonesian identity? FXH: The advancement in information technology, the strength of the current world economy and trade has created globalisation. This has created divisions between nations, between the West and the East, yet the boundaries between one ethnicity and another has diminished overtime. Unique cultures have become diffuse and intermingled, particularly in big cities where it is difficult to prevent migration and foreign influences. The search for a coherent identity becomes more difficult. Who can say whether the representation of traditional culture in works of art is the correct formula? Because if we really think about it, what is tradition and which tradition are we talking about? Do we, as modern human beings, understand the true meaning of tradition? How is tradition situated within our daily practice? There are many questions that could be posed: can there be a mix between tradition and modernity rather than an outright refusal of Western culture? Nowadays, there are a number of artists who have revived traditional artforms in their practice, but because they don’t have a deep understanding of these traditions, their work easily becomes exoticised. Unfortunately, many developed nations also have very little understanding of what tradition truly means. Therefore, there is a tendency to read these works as ‘exotic’ and to consider this difference as an attribute of artworks from developing nations. This can be seen occurring now in prominent biennales around the world, as well as within the art market. But perhaps this question needs to be reframed. This question implies, when we deny traditions it means that we accept the West and vice versa. I feel that this question privileges a Western world view which considers itself the centre of world. As if in this world there are only two centres: the West as a representation of modernism and the developing world as a representation of traditions, a not-yet-modern world where their primitiveness is what makes them exotic in the first place. As an artist working in Indonesia, the West is no longer a significant concept to me because Asian nations today produce artworks that no longer reflect Western characteristics. I would even go so far as to ask, what is the West? How would you explain the West? Say, are there any particular shapes that represent the West? These same questions should be asked when it comes to tradition. For an artist and also for myself, the most important thing is to understand who I really am. What sort of ideologies have influenced my life and my process of art creation. How can I, as an individual, position myself within the development of contemporary cultural, social and political upheavals. We are no longer searching for the centre, whether it’s the West or tradition, as a reference point for producing works of art. Art with cultural context, social and political existence is far more substantial to me than those centres. Therefore, to understand myself as an individual and my position within society are far more more important to me. AJ: In this time of ever growing biennales and triennales, there seems to be a trend for curators and organisations to seek out ‘emerging’ artists in remote corners of the world. There has also been a shift towards Asia, both as a burgeoning economic powerhouse, and site of cultural plurality–perhaps akin to the ‘exotic’ of colonialism and cultural imperialism. You yourself have become well known outside of Indonesia. Do you feel any pressure to make art in a certain way? Or do you think that this attention on SEA can have a positive impact, creating more awareness of the complex histories and peoples in the region? FXH: It’s about time Southeast Asia gets the attention it deserves in its own context, not from a Western perspective. The Southeast Asian region has got cultural and historical identities that are not easily understood by many other nations. The world of commerce and politics are far from being adequate to lessen the gap between nations in terms of cultural thinking. In order for the rest of the world to know about us, proper research must be undertaken to truly understand, what is Southeast Asia? What is their cultural background and what issues are they facing? At this point in time, we can see that the rest of the world has started to look over at Southeast Asia. Japan, South Korea, Britain and Europe has started doing more research and diverted their attention toward art that has come out of Southeast Asia. This year, I will be a part of exhibitions with a particular focus on Southeast Asia– in Tokyo, New York, and Brussels–where prior to this, the curators have undergone an intense research process. Hopefully, these exhibitions will be followed by other equally important activities. I personally believe that Indonesia will play quite an important role in this artistic activity. FX Harsono studied painting at STSRI “ASRI”, Yogyakarta (Indonesia) from 1969-74 and at IKJ (Jakarta Art Institute) from 1987-91. Since 2005 he is lecturer at the Faculty of Art and Design, Pelita Harapan University, Tangerang (West Java). Harsono is also an active art critic, regularly writing about social questions and the development of contemporary art. 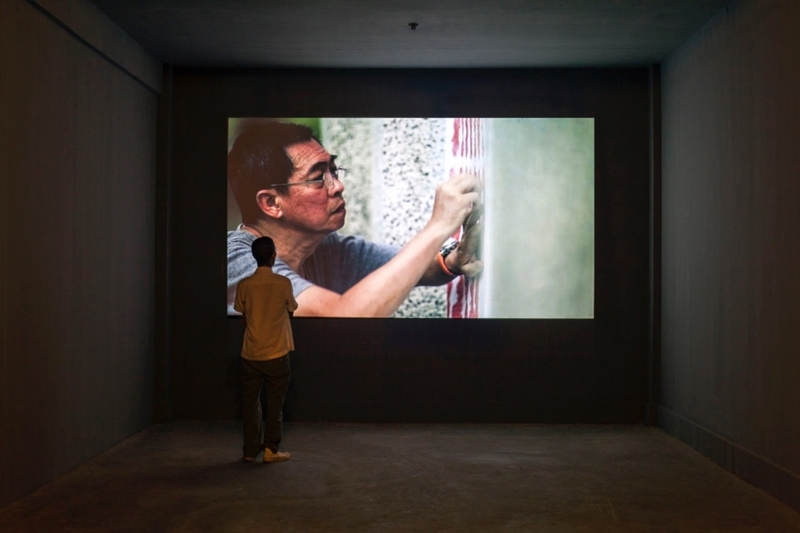 Recent solo exhibitions include What we have here perceived as truth/we shall some day encounter as beauty at the Jogja National Museum, Jogja, Indonesia (2013); Writing In The Rain at Tyler Rollins, New York, USA (2012); Testimonies at the Singapore Art Museum, Singapore (2010); and The Erased Time at the National Gallery of Indonesia, Jakarta (2009). Recent group exhibitions include Rosa’s Wound at MOCA Taipei, Taiwan, (2017); Quota 2013 at the Langgeng Art Foundation, Yogyakarta, Indonesia (2013); Outspoken at the Biasa Art Space, Bali, Indonesia (2013); and One Step Forward, Two Steps Back — Us and Institution, Us as Institution at the Times Museum, Guangzhou, China (2013). He participated in the 20th Biennale of Sydney, Sydney, Australia (2016); at the Fourth Moscow Biennale of Contemporary Art in Moscow, Russia (2011); and in the exhibitions Edge of Elsewhere at 4A, Sydney, Australia (2011 and 2012); Recent Art From Indonesia: Contemporary Art-Turn at the Museum of Contemporary Art, Shanghai (2010); Beyond The Dutch at the Centraal Museum, Utrecht, The Netherlands (2009); and Highlight at the ISI, Jogya National Museum, Yogyakarta, Indonesia (2008).